After recent studies conducted by the Centers for Disease Control and Prevention (CDC), medical experts found that elderly Americans are at an increased risk of depression when compared to other age demographics. For many older people, depression symptoms may be a sign of something more: elder abuse. According to the National Council on Aging (NCOA), roughly one in every ten Americans over the age of sixty have faced some form of elder abuse. Elder abuse can range from physical harm, financial exploitation, or emotional abuse, to even sexual misconduct. If your elderly loved one lives in an assisted-living facility, they may be facing an increased risk of suffering nursing home abuse. Maintaining a strong relationship with your elderly loved one can help you identify common symptoms of elder abuse. For family members with elderly loved ones in assisted-living facilities, preventing elder abuse can sometimes be impossible. Still, there are a few ways in which you can help to attempt to prevent your loved one from suffering the pain and trauma of abuse. Frequently visiting your loved one can help you get to know staff members, recognize changes in behavior, and regularly converse with your loved one. Simple conversations with your elderly loved one can be critical in noticing signs of both abuse and depression, which in many cases are related. The more contact you have with your elderly family member, the greater chance you have to identify and prevent abuse. Recognizing the symptoms of abuse can be key in preventing further abuse. In cases of nursing home negligence, physical signs of neglect could be as clear as bed sores, weight fluctuation, or other skin irregularities. In cases of overt physical abuse, victims may have noticeable bruises or other injuries. While emotional and psychological symptoms of abuse can be more difficult to recognize, they can be key in identifying elderly abuse. Emotional symptoms of abuse include social isolation, changes in behavior, and inability to or uncomfortability when talking to staff members. If you suspect your loved one is suffering abuse from a caretaker or assisted-living staff member, contacting a nursing home negligence attorney can be critical in ensuring they receive the medical attention and emotional support they need. At Flaherty Law, we know just how painful elder abuse can be for the entire family. Our firm has years of experience helping those who have dealt with the physical, emotional, and psychological trauma of elder abuse. 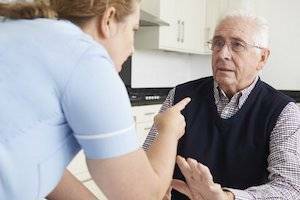 If you believe that your loved one is suffering from abuse, contacting a knowledgeable Plainfield nursing home abuse attorney can be critically important in helping to end the abuse and receive financial compensation for the harm they have suffered. To set up a free consultation, call us today at 815-577-7500.